In blackjack, the option to split your cards can be vital in order to increase your chances of winning, and lowering the house edge. For long-term success, understanding the advantages, disadvantages and when to pounce on the opportunity to split, is crucial. Splitting, as explained on our terminology page, refers to the option of dividing our hand into two separate hands, upon being dealt a matching pair. We can split our hand if we are dealt two cards of the same value. For example, we can split two Aces, two Fours or two Kings. Depending on the rules, some blackjack games allow us to split non-matching face cards, because they are still valued at 10 points. For instance, we might be allowed to split a King and a Queen. When splitting, we must place an additional bet equal to our original wager to cover the second hand. Our original matching cards will then be physically separated from each other to form two hands, and we will then be dealt an additional card for each new hand. Now, we play out our hands one at a time, just as we would if we had bet two hands at the start of the round, and we can opt to hit, stand, double down and even split again if the opportunity arises (although some games do not allow us to split again after already having split). Note: If you are playing in a land-based casino, you must refrain from touching your cards at all times. Again, depending on the style of 21 we are playing, there can be some slight variations in the rules regarding splitting, but there is always a level of restriction to limit or balance the tactic. The main rule which changes from game to game is the continual splitting option, where if we receive two of the same cards and opt to split them, and then receive another card of the same value, we may or may not be able to split again (and again). If you split a pair of Aces, you will only be dealt one more additional card and you cannot hit, double down or split your hands any further and must work with the cards you’re dealt. If you split your hand once, further splits or double downs are not allowed. If we are playing a standard game of blackjack, then standard rules stipulate we can generally split our hands up to a maximum of three times, which would mean we would be playing a total of four hands. Having said that, always check the rules before you begin playing either online or at a B&R casino to avoid confusion. It is important to try and make sure you have enough chips left so if you are dealt a couple of hands in which you’d be best served to split, you aren’t out of cash. A common misconception for many in regards to splitting cards is that they should do so every time they receive a matching pair of the same value. 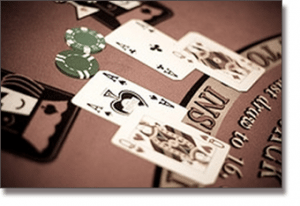 Like all blackjack moves, splitting should be carefully considered and the dealer’s up-card should always be taken in to consideration. A pair of Aces is undoubtedly the most popular hand to split. By rule of thumb, we should always choose to split two Aces if we are dealt such a hand. In doing so, we are giving ourselves a greater chance to draw at least one blackjack hand. Alternately, if we opted to keep both Aces for a total value of either two or 12 points, this would eliminate and waste the potential for two separate hands reaching a natural blackjack. In some games, if we hit blackjack (whether it be after splitting or without splitting), we are paid out immediately, regardless of what the dealer has. Note: Due to the popularity of splitting Aces in blackjack, should a split Ace be dealt a card valued at ten, some casinos and their rule variations will not regard that as a natural blackjack, and will not payout 3:2, but rather 1:1 Try to avoid such rules.